Sometimes finding projects to crochet for boys can be difficult. 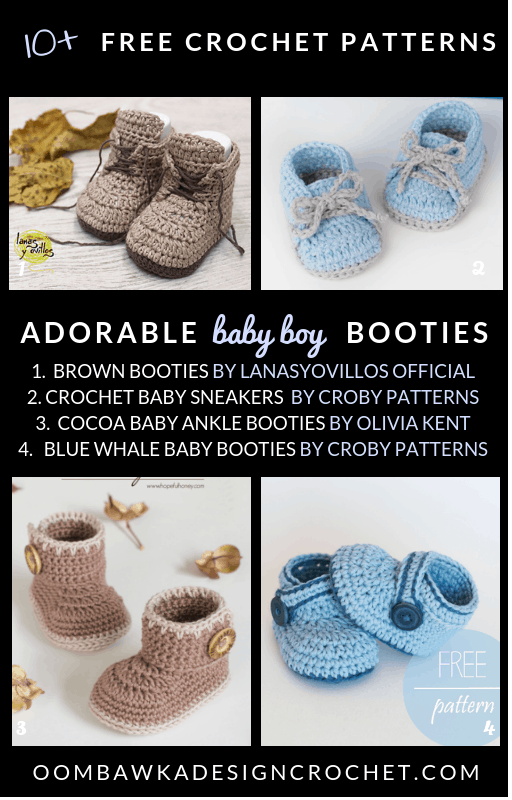 This week I have created a free pattern roundup that includes free crochet patterns for baby boy booties because Boys need cute crochet patterns too! Beneath the collage image you will find a list of baby crochet patterns. Simply click on the title to be taken directly to the free pattern. 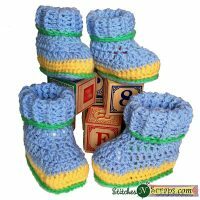 If you are on Pinterest I also have a board dedicated to crochet patterns for boys. You can find and follow the Crochet for Boys Board here. Size 0-6 months. 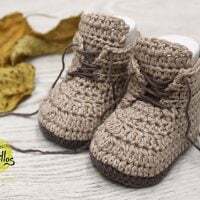 To make these adorable crochet baby sneakers designed by Doroteja at Croby Patterns, you will need a 3.5 mm hook and DK weight yarn in 2 colors. She also has an ad-free PDF available if you prefer. 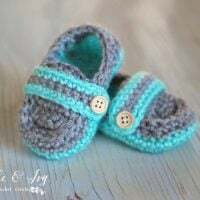 The Blue Whale Baby Shoes Pattern designed by Doroteja at Croby Patterns is sized to fit babies from 0-6 months of age. You will need a 3.5 mm hook and DK weight yarn in 2 colors. There is also an ad-free PDF copy available if your prefer. These little baby booties are available in 4 sizes. The full written pattern is available for free and there is also a video tutorial to walk you through the pattern, step-by-step. Make these ridged baby booties with a 4.25 mm hook and medium weight yarn . The pattern is available in sizes 0-6 months and 6-12 months. 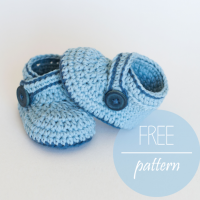 You will need a 3 mm hook and DK weight yarn  to make these baby ankle boots. The pattern size is 0-12 months. 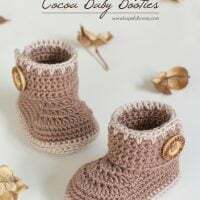 This brown booties pattern is available in English and in Spanish. Video tutorials are available too. Sizes available 0-3 months (2.5 mm), 3-6 months (3.0 mm), 6-9 months (3.5 mm) and 9-12 months (4 mm). Make these striped booties with a 4.25 mm hook and Light Weight Yarn . Available in sizes 0-6 months and 6-12 months. Available in sizes Newborn to 12 months. You will need medium weight yarn  and a 5 mm (H) hook. Always a favorite are the Newborn High Top Booties. This free pattern is available in size newborn, with a video tutorial. You need a 3.5 mm hook and DK weight yarn. These sweet baby booties are available in a 0-3 month size. You will need both a 4 mm (G) and 5 mm (H) hook and DK weight yarn. This pattern is available in US and UK terms. These cute baby loafers are demonstrated for free in a video tutorial only. If you'd like a copy of the written pattern there is a PDF version you can purchase at the link below. The pattern is available in sizes 0-3 months, 3-6 months and 6-12 months, simply by changing the hook size you use! The written instructions for these adorable newborn converse-style slippers is available in the description box on YouTube. The video demonstrates how to make them from start to finish. This great pattern is available in 4 sizes from Newborn up to 12 months. The written instructions are listed in the description box on YouTube and there is also a great video tutorial to help you with the pattern.